In TBX documents with prototypes already defined, when a map icon (note, container, agent but not adornment) is selected a tab in $Color is shown bottom right of the icon. Otherwise, the tab is not shown, regardless of whether a note is selected. This method makes it much easier to leverage Map view for fast note-taking. If a prototype is set for the currently selected note, the tab shows the prototype name or else the tab is blank. Map adornments do not show a prototype tab when selected. For a selected note click-holding or right-clicking on the icon's prototype tab gives a pop-up list of all prototypes available in the current TBX allowing the user to set, change or clear the note's $Prototype value. Such a menu is only displayed if there are prototypes defined in the TBX. 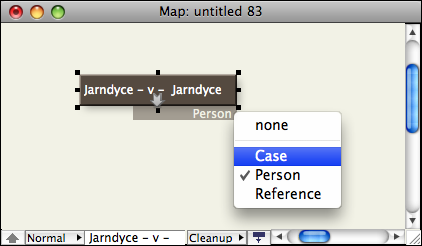 Setting a prototype on an alias sets the original note's Prototype value. If multiple notes are selected, using the above method on any one of the selected items' prototype tab will result in all items changing their prototype assignments. The text colour used in prototype tabs is normally the background colour of the map ($MapBackgroundColor). This usually works well, but can be difficult to read in low-contrast colour schemes where the note color is close to the background colour. In the latter scenario, if the two colours have similar luma, Tinderbox instead chooses either black or white for the prototype tab text.